For Andrea Shaw, it was a matter of being in the right place at the right time. For the injured stray dog, it was one more lucky twist of fate that would bring him back to health and to a new home in Maine. “He jumped into my arms and I just haven’t let go of him since,” said Shaw, a lawyer who lives in Gorham. Shaw was on a business trip to Columbus, Georgia, on the evening of July 10 when she took a walk after having dinner with a colleague. It was there she encountered a thin and badly injured dog, which immediately hobbled over to her. “I knelt down and he jumped into my arms, gave me kisses and let me hold him,” she said. Shaw felt an immediate bond with the dog. Soon thereafter she was approached by Jarrett Little and Chris Dixon, two bicyclists who had just carried the injured pup 7 miles. Little and Dixon had come across the dog while they were biking through the Oxbow Meadows Environmental Learning Center in Columbus. They had come to a roundabout in their path, where a group of bikers had gathered, when they first saw the dog. “When we stopped he immediately approached us and we could tell he was hungry and thirsty,” Little said in a phone call Saturday. Little added that they were in “the middle of nowhere” and were surrounded by swamps that possibly contained alligators and there were no houses nearby. So they made the decision to carry Columbo on the 45-minute bike ride to a populated area of Columbus. However, keeping the 38-pound dog on a bike for a long ride was no easy feat. Little had to keep switching positions, and ultimately ended up tucking Columbo’s hind legs into pockets on the back of his shirt, with his front paws holding on to his shoulder. Soon after they arrived in town, they had set down Columbo for just a moment when they came across Shaw. “The instant I put him down he ran right to her,” he said. Little had gone to fill up a bowl of water for the dog, and when he came back out, Shaw had the dog on a leash and was already set on helping him. The first thing Shaw did was get Columbo to an emergency veterinary clinic. She also spent hours scouring the Georgia lost dog website looking to see if anyone was searching for him. Veterinarians at the clinic found that the dog’s injuries had likely occurred 10 to 14 days earlier, according to Shaw. His leg had been broken in multiple places, and they guessed it was a result of being hit by a car. But time was of the essence, and Columbo was not in any position to travel up to Maine. They were able to get the dog into surgery July 12, the day before Shaw needed to leave. 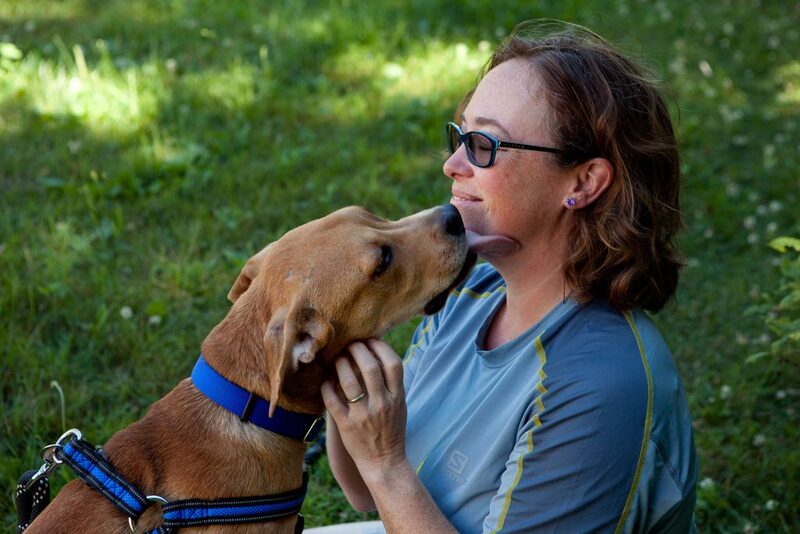 Shaw worked with Grateful Doggies Rescue Retreat, which helped get Columbo to his new home over 1,000 miles away. Fast-forward 10 days and Columbo is settling into his new life in Maine at Shaw’s house in Gorham, complete with her two other dogs, Pluto and Levi, and a horse and pony to keep him company. He’s being taken care of by Dr. Meghan Sullivan at Animal Emergency and Specialty Care on Warren Avenue in Portland. There Columbo is set to go through physical therapy and other treatment as he recovers over the next six weeks. Little credits Shaw for her selflessness in rescuing Columbo. The pup has also received an immense wave of media attention. Shaw started a Facebook pagecalled Adventures of Columbo, showing his road to recovery. On Sunday morning he had close to 15,000 followers. Both Little and Shaw have been bombarded with requests for interviews from people and news stations all over the world. Little was the one to initially share the photo on Facebook of Columbo getting a ride on his back, and says he’s been getting requests for interviews every 30 minutes. For now Columbo, whom Shaw calls Bo for short, is just enjoying his new life in southern Maine and adjusting to the temperature difference from central Georgia. Shaw’s 5-year-old son, Christopher, was quick to claim Columbo as his dog, and has been sleeping by his side each night to watch over him.